July 11th, 2001 - ATTENTION ARTISTS: Anyone with a FanArt galley can now link directly to their gallery from their website!! The navigation now supports this. July 9th, 2001 - The issue #26 cover is now available as a high quality scan: CLICK HERE This cover is very different than first shown, see what the cover WAS going to be HERE. July 9th, 2001 - Changed the Cover Gallery and Profiles Section so they DO NOT open in a new browser window. July 7th, 2001 - BIOMOTO has colored one of his FanArt submissions, and the results are amazing. CLICK HERE to enter his gallery and see the latest addition. July 5th, 2001 - #26 of StDA was released! I will have a scan of the cover up soon and some images from this latest issue added to the character profiles gallery. June 27th, 2001 - Zak Lowry has an all NEW gallery in the FanArt Section, you can view his work HERE. Biomoto has added an awesome medieval Spawn to his Gallery. June 21st, 2001 - Major changes to the site! Most importantly, a new section has been added that is devoted to StDA Fans helping create MORE Fans: CLICK HERE TO GET INVOLVED Also combined the Updates with the News Section to streamline things, and created a new background for the Start Page. June 16th, 2001 - All new Image Gallery added to the Kevin Conrad Section. You will find several original pieces AND an awesome look at the Nanosaur work being done by Richard Bonk (pencils) and Kevin (inks): CLICK HERE. June 15th, 2001 - An ALL NEW splash page for the site has been uploaded, and it is original artwork by Richard Bonk: CLICK HERE. You will also want to check out the incredible inked version of his Dark Ages Fanart: View it HERE. June 12th - Have a look at the upcoming covers for Dark Ages, Ashley Wood just keeps getting better. The following images can be found at www.spawn.com. Special Thanks - A very huge thanks to JASON CLARKE! His letter, printed in issue #24, mentions this StDA website WITH a URL and compliments. What a thrill! Thanks again Jason. April 8th - Here is a peak at the cover for The Dark Ages #29. This preiview comes to you from the outstanding official site of Todd McFarlane: spawn.com. April 7th - The high quality scan of cover #24 has been added to the Cover Gallery. March 29th - New IN DEPTH and EXCLUSIVE interview with StDA colorist Todd Broeker. Simply CLICK HERE to read the intensive Q & A. March 8th - You ready for Kevin Conrad? Check out the EXCLUSIVE INTERVIEW in the Creative Team section. March 2nd - NEW FAN POLL! You want to see The Dark Ages transformed into an animated series on HBO? CLICK HERE NOW to place your vote. March 2nd - Incredible FULL COLOR Preview of the upcoming #24 issue of Dark Ages. Once again, many thanks to Todd Broeker for this great glimpse at the next issue! March 2nd - Want to have a look at the next 5 covers for StDA? No problem. 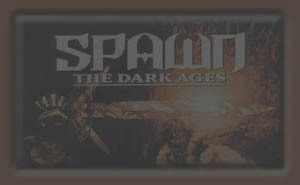 The following images can be found at www.spawn.com. Thanks to Blood Pig for the heads up. February 27th - How about an EXCLUSIVE INTERVIEW with StDA writer Steve Niles? No problem! Part One of 'The Mind of a Horror Writer' is now up in the Creative Team section. Simply CLICK HERE to enjoy it. February 19th - Head to ozcomics.com for a killer in depth conversation with StDA penciler Nat Jones. This site is even credited as a main source of info for the interview! February 10th - StDA's FIRST FAN POLL is here! Participate by placing your vote in the first ever online poll for The Dark Ages... results will be sent directly to the creative team and may have a DIRECT IMPACT on the book. February 6th - IMPORTANT!! Todd Broeker (StDA colorist) has offered some VITAL information that we the Fans can use to help keep our favorite comics in production. CLICK HERE and help StDA live on for a long time to come! February 6th - Ashley Wood has a new Dark Ages offering at his revamped website [ www.ashleywood.com ]. Check out the awesome image RIGHT HERE!! Thanks to Clay for the tip. December 14th - Check out a preview of Dark Ages cover #25. You can also read a plot summary for issue #25 but, as always, HUGE SPOILER WARNINGS! You can read the summary HERE. December 12th - Todd Broeker (TMP Color Art Director) has this to say about Issue #22 of StDA: "It's going to be a cool issue: Lot's of Spawn and a new twist to the plot. It's a BIG new element to the story that I can't share, and I don't know what art I can send you, yet. I'll keep you posted. All I can say is this is a brilliant development to the story and the fans will love it. It should keep people coming back for more for some time." -Don't know about anyone else, but this has me excited! November 24th - Good News!! I was able to find the preview cover for #23. Check it out right here. If you would like, you can read the summary for #23 as well, but HUGE SPOILER WARNING this time. Read the summary here. November 24th - You can check out a preview of the #24 cover for Dark Ages right here!! I have tried locating a cover sample for #23, but I cannot seem to find it, any help would be appreciated. This StDA #24 preview was found at Comics Continuum and thanks to Spacebass who first posted this pic on the official spawn board. You can also read a summary for StDA #24, but BE WARNED, there are major spoilers. Check it out here. November 22nd - !! Issue #20 of StDA hit today !! Head over to the Devil's Pawn Tavern forum for intense discussion about the latest issue. It is truly an incredible read, Nat is somehow improving with each book, and Niles is creating tremendous atmosphere with his storytelling. You can also go to the StDA Cover Gallery to view a high quality scan of Ashley Wood's Dark Ages #20 cover. November 21st - !! Special PREVIEW !! of page 1 from issue #21 of Spawn: The Dark Ages. That's right, hopefully every month, you can expect a FULL SIZE high resolution preview from an upcoming issue of StDA! Thanks to Todd Broeker (new colorist on StDA) for all his support. With his help, this site is going to bring you some truly awesome material. November 20th - I have just been informed that a mistake was made on issue #19 of Dark Ages. It was in fact Todd Broeker that did the coloring for that issue, and he will be taking over that job permanently. There is a retraction printed in #20 to clear up the confusion. November 11th - This section will soon have original articles written by myself and other Fans of StDA. I also hope to have Interviews with the Creative team behind the book, and comments about the issues directly from those that bring us this awesome title each and every month.